Western blot analysis of extracts from HeLa cells, transfected with 100 nM SignalSilence® Control siRNA (Unconjugated) #6568 (-) or SignalSilence® Bmi1 siRNA I (+), using Bmi1 (D20B7) XP® Rabbit mAb #6964 (upper) or α-Tubulin (11H10) Rabbit mAb #2125 (lower). The Bmi1 (D20B7) XP® Rabbit mAb confirms silencing of Bmi1 expression, while the α-Tubulin (11H10) Rabbit mAb is used as a loading control. CST recommends transfection with 100 nM Bmi1 siRNA I 48 to 72 hours prior to cell lysis. For transfection procedure, follow protocol provided by the transfection reagent manufacturer. Please feel free to contact CST with any questions on use. 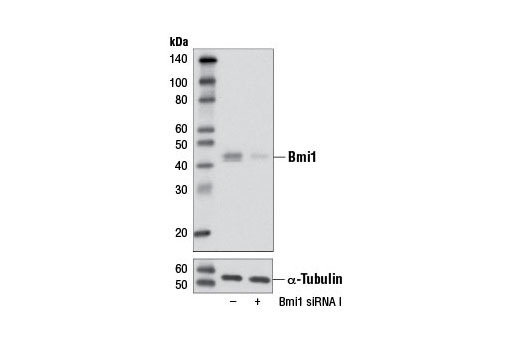 SignalSilence® Bmi1 siRNA I from Cell Signaling Technology (CST) allows the researcher to specifically inhibit Bmi1 expression using RNA interference, a method whereby gene expression can be selectively silenced through the delivery of double stranded RNA molecules into the cell. All SignalSilence® siRNA products from CST are rigorously tested in-house and have been shown to reduce target protein expression by western analysis. The polycomb group (PcG) of proteins contributes to the maintenance of cell identity, stem cell self-renewal, cell cycle regulation, and oncogenesis by maintaining the silenced state of genes that promote cell lineage specification, cell death, and cell-cycle arrest (1-4). PcG proteins exist in two complexes that cooperate to maintain long-term gene silencing through epigenetic chromatin modifications. The first complex, EED-EZH2, is recruited to genes by DNA-binding transcription factors and methylates histone H3 on Lys27. This histone methyl-transferase activity requires the Ezh2, Eed, and Suz12 subunits of the complex (5). Histone H3 methylation at Lys27 facilitates the recruitment of the second complex, PRC1, which ubiquitinylates histone H2A on Lys119 (6). Bmi1 is a component of the PRC1 complex, which together with Ring1 strongly enhances the E3 ubiquitin ligase activity of the Ring2 catalytic subunit (7). Bmi1 plays an important role in the regulation of cell proliferation and senescence through repression of the p16 INK4A and p19 ARF genes and is required for maintenance of adult hematopoietic and neural stem cells (3,4,8-10). Park, I.K. et al. (2003) Nature 423, 302-5. Molofsky, A.V. et al. (2003) Nature 425, 962-7. Molofsky, A.V. et al. (2005) Genes Dev 19, 1432-7. Jacobs, J.J. et al. (1999) Nature 397, 164-8. Jacobs, J.J. et al. (1999) Genes Dev 13, 2678-90.